Following up on FMEP’s reporting last week, on April 4th the Israeli Civil Administration Higher Planning Council (the body responsible for regulating all construction in the occupied West Bank) advanced plans for at least 3,659 settlement units, including a plan to retroactively legalize homes in the unauthorized Haresha outpost. This is the largest batch of settlement plans advanced at one meeting by the High Planning Council since President Trump took office in January 2017; previous High Planning Council meetings (which happen every three months, per a reported agreement with the U.S. Administration) advanced plans on the order of 1,000 to 2,000 units. 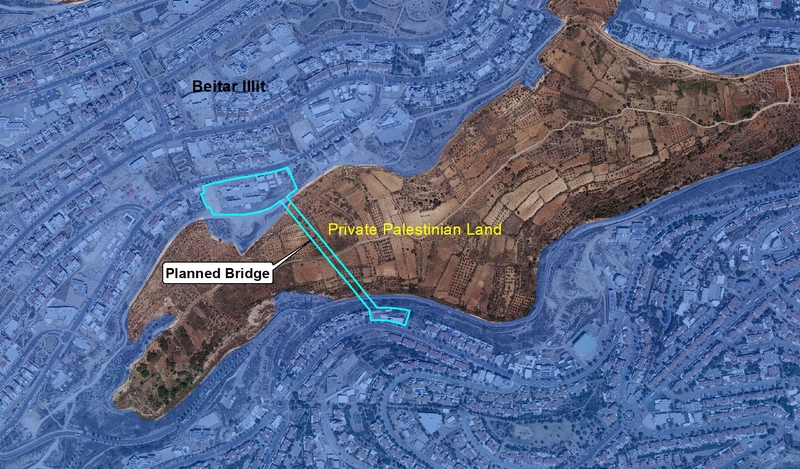 A new pedestrian bridge over privately owned Palestinian land for Israeli settlers to use on the Sabbath (when observant Jews do not drive, and had to walk a long route in order to reach other parts of the settlement). A plan to retroactively legalize residential units in the Sde Bar settlement; Peace Now has not yet verified how many units are involved in this plan. Sde Bar was first established as an outpost of the Nokdim settlement in 1998, but Israel granted full approval to that outpost, recognizing it as an educational institute and a full-fledged settlement, in 2005. Settlers recently built a residential neighborhood there without Israeli authorization. The plan approved by the council on April 4th will grant retroactive authorization to those residential settlement units. 289 new units in the Alon settlement, located on the Palestinian side of the separation wall within sight of the Khan al-Ahmar bedouin village that Israel is prepared to forcibly relocate. There are plans to expand the neighboring Kfar Adumim settlement to takeover the land where Khan al-Ahmar currently stands. 110 new units in the Givat Zeev settlement. 108 new units in the Etz Efraim settlement. 85 new units in the Karnei Shomron settlement. A plan to retroactively legalize 720 units in the Haresha outpost. This is part of the Israeli government’s ongoing efforts to retroactively legalize the outpost, which hinges on Israel’s ability to build a legal access road to the outpost. The Israeli government has found several creative solutions to that problem – like building a tunnel or building a bridge – all of which will undoubtedly infringe on the property rights and livelihoods of the Palestinian land owners. 147 units in Mitzpe Yericho. 114 units in Elon Moreh. 73 new units in Beitar Illit (in addition to the final approvals covered previously). 42 more units in Givat Zeev. 32 units in Beit Arie. 7 new units in Rehelim. An unverified number of new units in the following settlements: Paduel, Karnei Shomron, and Elkana. On April 4th the Israeli Ministry of Housing and the Israel Lands Authority met and published tenders for the construction of 956 new settlement units, including commercial complexes; 106 tenders are for plans in settlements east of the separation barrier. These units are in addition to the 3,659 units advanced this week by the Civil Administration’s High Planning Council (discussed above). 250 units in the Elkana settlement. 195 units in the Ariel settlement. 118 units in the Ofarim settlement. 112 in the Alfei Menashe settlement. 111 units in the Oranit settlement. 62 in the Adam (Geva Binyamin) settlement, located east of the separation barrier. 50 in the Emmanuel settlement. 44 units in the Maale Ephraim settlement, located east of the separation barrier. On April 12th, the Israel Higher Education Council voted to approve a new medical school in Ariel University, located in the West Bank settlement of Ariel. This approval contravenes the normal practice of the council, in that it ignores a vote to reject the school by the Higher Education Council’s own professional subcommittee. The medical school is slated to open this fall with significant financing from American casino magnate (and Trump supporter/financial backer) Sheldon Adelson. However, the High Court of Justice is set to hear a petition regarding the unusual and scandal-ridden process by which the school gained approval at various stages of the planning process. The petition was filed by two Israeli academics – Prof. David Harel of the Weizmann Institute of Science and Prof. Alon Harel of the Hebrew University of Jerusalem – asserting that the approval “casts a heavy shadow on the decision making process in higher education.” It is unclear how the outcome of the petitions might affect the newly approved plan to open the medical school this fall. Settlers are mostly celebrating the results of Israel’s April 9th elections (in which West Bank and East Jerusalem Palestinians could not vote), which delivered incumbent Prime Minister Netanyahu an opportunity to form and lead the next government. Not all settlers believe that Netanyahu will deliver on his promise to annex the settlements, but generally speaking, settlers dismiss the “will he/won’t he” debate (perhaps correctly) as a political decision that does not impact the reality of their presence on the ground. AirBnB’s new announcement acknowledges (again) that settlements are “central to ongoing tensions,” but says it will nonetheless continue to allow those listings to remain on their website. Giving a nod to the controversial nature of this decision, AirBnB promised to donate all profits derived from West Bank settlement listings to humanitarian groups, but it conspicuously specified that these will be humanitarian groups working in other parts of the world (as opposed to with the Palestinians). U.S. Ambassador David Friedman tweeted his support for the new Rami Levy mall, located in the Atarot settlement industrial zone within sight of Ramallah but inside the security barrier and within Israel’s municipal border, as expanded by Israel after the 1967 war.